Ocean Grove coach Paul Lynch says the Grubbers are more advanced with their pre-season preparations than in 2017 after a solid win against Geelong West at Oakdene on Saturday. Lynch, a second year coach at Ocean Grove, was pleased with side’s progress after two wins from its three pre-season practice matches against Keilor (lost), Diamond Creek (win) and Geelong West. 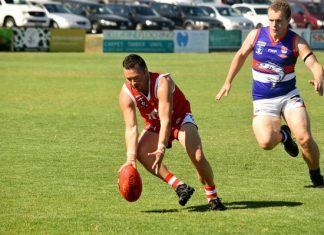 The Grubbers will now prepare for its Bellarine Football League Round 1 season opener across the Easter bumper weekend against Portarlington at Ray Menzies Memorial Oval on Saturday 31 March. “We have been working on a few things and I think we are long way further advanced than we were last year and that’s where we want to be,” Lynch told the Voice. “Pressure was one of them and I think we have come a long way in that department. 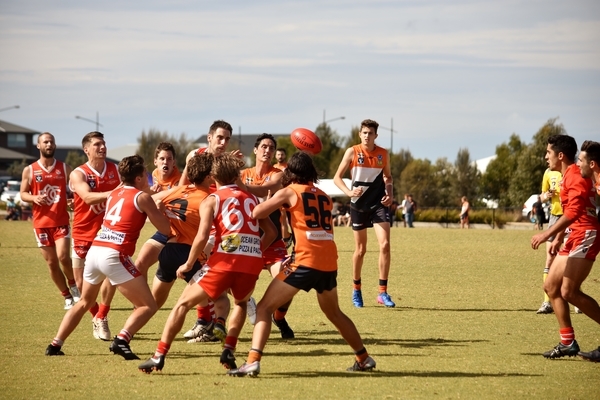 It was an impressive hit-out against the higher ranked GFL based Giants on 24 March. Ocean Grove came away with a 19-point victory in it third consecutive practice match at Oakdene Estate Oval. Final scores Ocean Grove 7.8 (50) to Geelong West 5.1 (31). Talented Grubber recruit Nick Lynch and silky midfielder Jahd Anderson both impressed and kicked multiple goals. Experienced Grubber duo Kaiden Long and Kelly Williams gained valuable match practice, while Andrew Jarvis had a quality hit-out before Round 1 in the ruck. Ocean Grove rested key stars including Jake Carmody and Luke Cartelli. Key youngster Matt Caldow was sidelined with a groin injury in the first half and took no further part in match after half time. The Grubbers Under 19s and Reserve grade teams both played practice matches against the Giants prior to the senior clash. Ocean Grove’s senior home match against Portarlington starts at 2:10pm this Saturday.